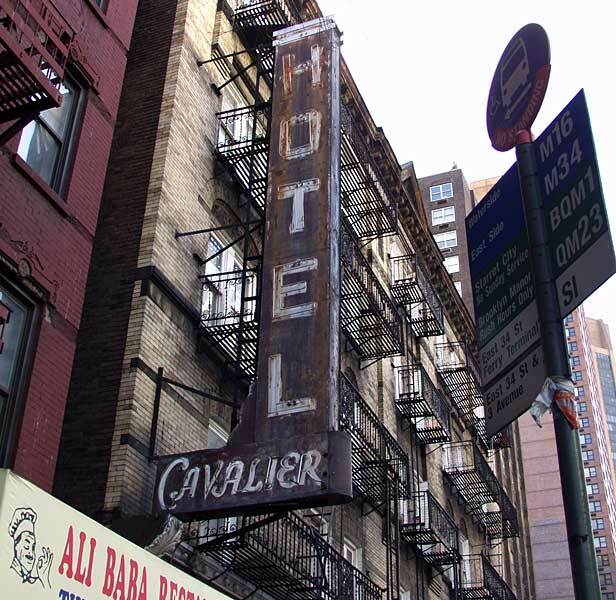 This "overhang" sign is a classic of its type and was approved in July 1940 by the city's Dept. of Housing and Buildings. Click here for sketch on the application for the proposed sign, to be erected by K & K Sign Erectors at an estimated cost of $400. The building at that time belonged to Philip Edwards and the hotel was run by Sol Oberwager. Also erected in 1940, probably at the corner of the building, was an additional sign reading "Hotel / Rooms / Ent on / 200 E. 34 St / $1.00 / & up". This is no longer extant. This building was constructed as a hotel in 1888 by the real estate developer George R. Read, 9 Pine St. (See Read Real Estate sign at 5th Ave. and 35th St.) The architect was Bassett Jones, 49 Broadway. The building was a 5-story brick structure (estimated cost $45,000) intended as a hotel with "5 families each floor, 20 in all, first floor to be used as stores." In 1901 the building belonged to the estate of John H. Ballantine (heir to the famous Ballantine Ale brewer, Peter Ballantine (for more on the Ballantine brewers see Fallstaffbrewing.com)) and was leased to John F. Wellbrook and Christ H. Wellbrook. They engaged the architect Richard Rohl to redesign the building for elevators and to re-apportion the hotel space so that there were an office and 16 rooms on the second floor and 18 rooms on each floor on the third to fifth stories. There were also major changes to the plumbing and fixtures at this time, seemingly to add to the number of bathrooms. In 1919, while still owned by the estate of John Ballantine, the building was described as "formerly occupied as a hotel but now vacant." A photograph by the Somach Photographic Company dated 7 Jan. 1939 shows this corner of 34th St. when the sign here read "34th St Hotel Rooms $1.00 Up." This can be seen on the New York Public Library's Digital Collections. From at least 1940 until the mid-1960s Philip Edwards owned the building, at times in the capacity of president of Philmat Realty (Philip Edwards and his wife Matilda Edwards).